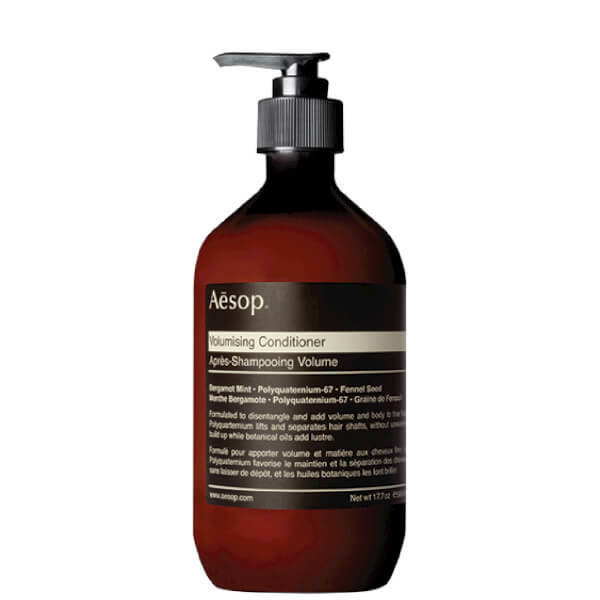 Designed as a treatment for fine or flat hair, the Volumising Conditioner by Aesop is specially formulated with essential oils and Polyquaternium to lift and separate the hair shaft while detangling, without leaving residual build-up. Hair is boosted and fortified with enhanced lustre and volume. The hair conditioner's innovative blend contains rosemary, bergamot mint and fennel essential oils, a choice selection of oils with long established hair and scalp-care benefits to promote shine, improve texture and soften hair. Light-weight with a minty herbaceous aroma, the conditioner is easily applied to hair. Directions: Using a single pump measure of conditioner, apply to freshly shampooed hair, working from the mid-length to the ends of hair. Leave for two to three minutes before rinsing thoroughly with warm water.